From left, McKenna, Wiens, Ward and Reiter. Photo by Evan Hanover. Awkward dialogue. Misunderstood references. Two people with obscure diseases. Two couples named Jones. Two marriages in flux. The Realistic Joneses is about life and the fear of death—and about the life and decline of a marriage. It’s melancholy, unsettling and sometimes funny. Playwright Will Eno seems to want us to sympathize with these four people but none of them are fully drawn characters. The new production, directed by Jeremy Wechsler and staged by Shattered Globe and Theater Wit at Theater Wit’s home on Belmont, is one of those stories where nothing much happens. An older couple, Bob and Jennifer Jones (H.B. Ward and Linda Reiter), live in a small town with a view of the mountains. One evening they’re sitting on their patio enjoying the warmth and sounds of the evening when their new neighbors stop in. John and Pony Jones (Joseph Wiens and Cortney McKenna) have brought a bottle of wine to introduce themselves. On the whole, The Realistic Joneses is a strange story of coming existential crisis. And isn’t this what we all face at some point, whether it’s a medical condition or a disastrous accident ? The performances by all four actors are capable and Wechsler’s thoughtful direction draws out what flavor there is in each scene, as the characters take pleasure in the night sky, fireworks, dining out. Performances by Ward and McKenna are the most believable. Jack Magaw’s scenic design skillfully moves between the two homes—Bob and Jennifer’s patio and John and Pony’s small kitchen. Lighting is by John Kelly. Christopher Kriz handles sound design and original music. Will Eno’s plays, known for their quirky dialogue, include Middletown, Title and Deed, Thom Pain (based on nothing) and The Open House. The Realistic Joneses premiered at Yale Repertory Theatre and was staged on Broadway in 2014, where it won several awards. 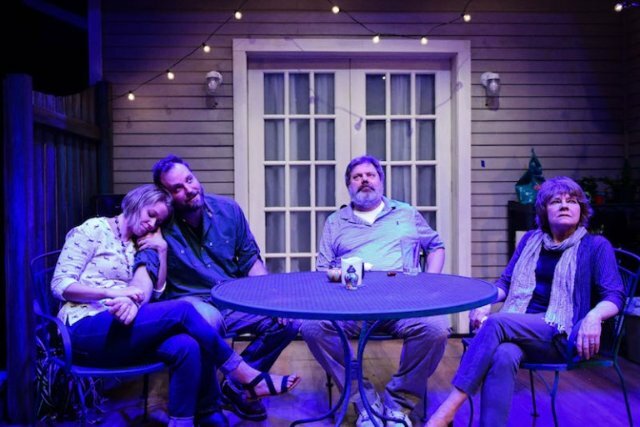 The Realistic Joneses continues at Theater Wit, 1225 W. Belmont, through March 9. Running time is 100 minutes with no intermission. Tickets are $24-$74.